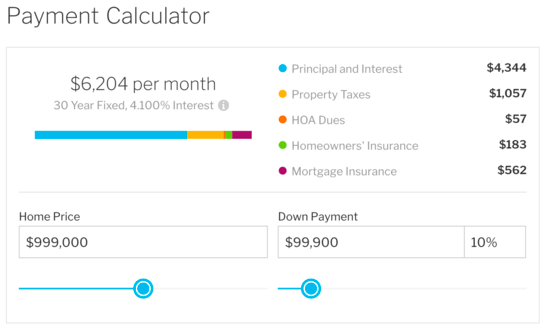 Are Mortgage Calculators Actually Accurate? Just about anyone looking to buy real estate or apply for a mortgage refinance will rely upon a loan calculator to get a better understanding of what their monthly payment might be. Let’s start with the basics. Any mortgage calculator worth its salt should let you calculate principal, interest, taxes, insurance, and even include PMI and HOA dues. Why? Because these are all very real costs. If it simply shows you principal and interest, you’re missing a pretty decent chunk of the payment, assuming your mortgage has impounds (which many do), or if you live in a condo or put less than 20% down and didn’t opt for LPMI. I conducted a little research on Google by looking up the first few mortgage calculators that came up in their search. The first result, which was from a generic mortgage calculator website, asked for a home value, a loan amount, an interest rate, loan term, and start date. It also assumed a 1.25% property tax rate and 0.5% for PMI. My issue with this calculator is that it assumes the user knows a thing or two about mortgages, which I know isn’t the reality. Many people don’t know the first thing about mortgages, and most certainly don’t know what PMI is. Or if it costs 0.5% of the loan amount. The PMI thing is a problem because borrowers may not actually have to pay it, so including it by default can throw the numbers off in a hurry. Strangely, when I changed the PMI value, the monthly payment output from the calculator was the same because this calculator doesn’t actually add it to your payment, it simply displays the monthly cost of the PMI in the details below the total payment. 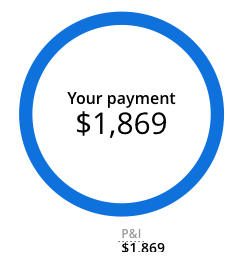 My guess is most users probably won’t see that, or take the time to add the two numbers up to see what their true monthly payment might be with PMI included. Homeowners insurance is also ignored here, which is mandatory for all mortgagors, so the chances of this calculator being accurate are slim to none. It might give you a decent ballpark, depending on your loan and LTV, but people don’t use calculators to get rough estimates. And the full housing payment including insurance, taxes, HOA dues, etc. Next up in the search results was Zillow’s mortgage calculator, which included property taxes and homeowners insurance by default. To me this one was already superior because it included the full PITI mortgage payment. One slight difference was that they calculated property taxes at a rather low 0.75%, as opposed to 1.25%. While it seems like no big deal, it could easily make or break a borrower. Their homeowners insurance estimate seemed fairly accurate for me, in California, but I know other states, like Texas, have much higher rates. So again, the numbers can get thrown off pretty quickly here as well. However, their calculator was much more intuitive with regard to PMI. If you entered in a 20% or higher down payment, it simply ignored PMI. If you put anything lower, it calculated it at around a half a percent, but also adjusted it based on loan amount and down payment. Still, actual numbers can and will vary, so these are just estimates once again. Also, you might not have to pay PMI, even if putting down less than 20%, so it might not apply. In the screenshots posted above, the first image is from Zillow’s calculator with only principal and interest accounted for. The second image to the right shows the same monthly payment with taxes, insurance, PMI, and HOA dues included. Once all costs are factored in the monthly payment is nearly 50% higher. So yes, it’s very important to consider and calculate all potential costs, and to utilize a calculator that gives you the option to include them all. The third result, which was a loan calculator from Bankrate, simply provided the principal and interest payment. Really bare bones. This is fine if you don’t have impounds and pay insurance and property taxes on your own, but otherwise it greatly diminishes what you’ll actually have to pay each month, as illustrated above. It also ignores the possibility of PMI and HOA dues, both of which could be costly expenditures to ignore. By the way, none of these calculators are geared toward FHA loans, which come with both upfront and monthly mortgage insurance premiums that will completely change the picture. So if you’re going with the FHA, use a calculator designed for FHA loans. All in all, I felt that Zillow’s calculator was the most thorough in that it included all the costs you might incur as a homeowner, though it did leave plenty of room for error if used incorrectly. 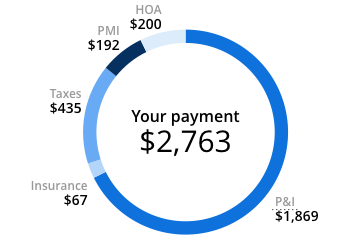 Additionally, I should point out that the estimated mortgage payments you’ll find toward the top of individual listing pages on Zillow (click on the star icon directly below the images) seem to be off when it comes to taxes and insurance, and as such, what you would expect to pay each month as a homeowner. They always greatly underestimate the cost, and I have no idea why. Well, I can think of one reason. But if you scroll down to the bottom of the listing page you should see a more accurate number that is pulled directly from the county assessor’s office in the “Home Expenses” section. Remember, if you’re serious about determining what you can afford, don’t just use a loan calculator, get the actual numbers from the source to see where you stand. Even seemingly minor miscalculations can sink your mortgage. For the record, many of the lower-end calculators or advertisements you see on TV or elsewhere will typically display the lowest monthly payment possible, typically just principal and interest, whether accurate or not. So take those with a huge grain of salt, or the entire shaker! I recently revisited this post and wanted to add the Redfin calculator to the mix. I’ve always felt that Redfin had more up-to-date and accurate property listing information relative to other real estate websites. They seem to factor in recent home sales more quickly than Zillow, which leads to more accurate estimated home values. And it appears that their loan calculator is also more on point. For example, I ran one home purchase scenario through both Zillow and Redfin and the results were night and day. On a hypothetical $999,000 home purchase with a 10% down payment, Redfin came up with a total payment of $6,204 per month, while Zillow had a monthly payment of just $5,511. That’s a difference of roughly $700. Not small potatoes by any means. Again, the culprit was property taxes and homeowners insurance, which were both way underestimated by Zillow. Additionally, Redfin automatically pulled HOA dues from the property listing and inputted them into their calculator. While still not perfect, largely because they seem to lowball mortgage rates, it still feels like the best option out there at the moment from the big players. For the record, I’ve created a variety of mortgage calculators using Excel, and there are also several web-based calculators you can use from the drop-down menu above, including an early mortgage payoff calculator. 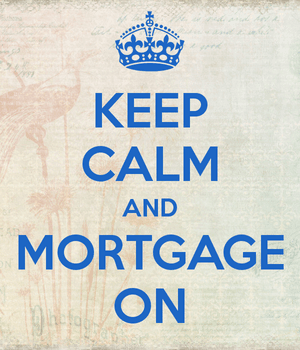 Read more: How are mortgages calculated (lots of math)? Zillow is problematic. I have no idea what insurance costs here in Oregon, but our property taxes are more like 1.35 – 1.4 percent. Right, I wouldn’t rely solely on their info/estimates to come up with your actual numbers. Hi Colin . I got an FHA loan on a 490k , 3.5 down plus pay all closing cost and PMI . the closing cost is very expensive on this loan . However I have 5 % cash on hand to put down and I heard that conventional has lower fees but higher rates . I have heard that both loans have pros and cons especially on PMI’s . What do you think would be better option ?